and are looking forward to your visit! Opening hours: 24 hours a day. TV project casting "KID NATION" in hotel MAGNET! Are you delighted with your talanted kid? Do you quote their wise and amusing phrases to the friends or relatives? If it's about you , please come to hotel MAGNET on 11.01.2016 and take part in "KID NATION" project. The most frightfull night of the year, spend it with us in Hotel MAGNET! The most romantic evening of the year - in hotel "MAGNET". Celebrate New Year 2012 in HAWAII style. 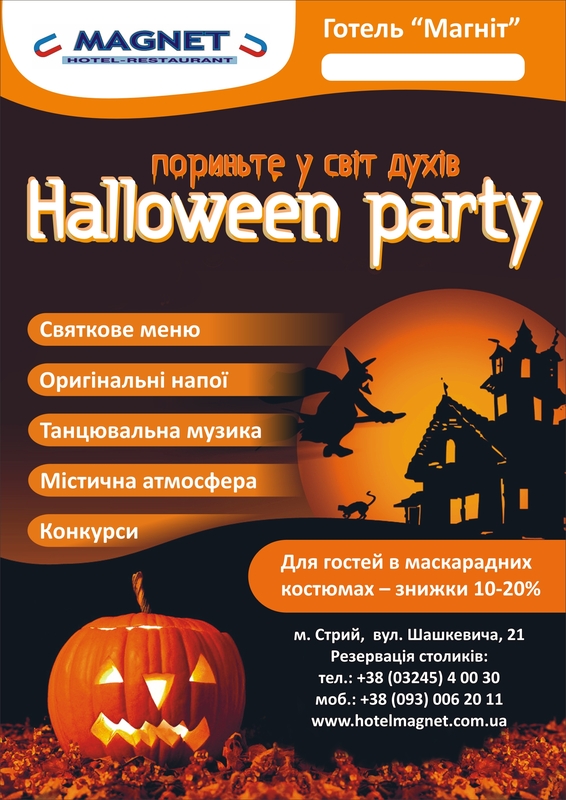 31.10.2012 - is the most frightfull night in the year, visit and spend it in hotel "MAGNET". © 2019 Hotel-Restaurant «Magnet». All Rights Reserved.